There are many tools that cities can use to achieve sustainable development; however, one finite resource that will be perpetually limited is space—a necessity for new roads, infrastructure, homes and buildings. Regardless of what initiatives are set in place, as the world’s cities grow, space is becoming increasingly precious. While TV shows like The Jetsons may have us longing for a city constructed in the sky, urban planners are already having success finding space elsewhere: underground. Beginning in mid-1800s, Tunnel Boring Machines (TBM) have allowed cities to create extra room to move, build, and—possibly in the future—house an ever growing population. TBMs were first used to drill through mountains, allowing rail roads to pass through elevated terrain instead of building up around the mountains. Engineers tunneled through mountains by utilizing manual labor, crude tools, and dynamite which was time-consuming, expensive, and dangerous. This 3D animation is an example of how a 110-ton, 300-foot-long tunnel boring machine will drill a distance of nearly two miles, 100 feet beneath the New York Harbor seabed. The new tunnel will act as a water siphon, ensuring a backup water supply to Staten Island and supporting the Anchorage Channel. Managed by Group Eurotunnel, the Channel tunnel is 31 mile passageway which connects Britain to France. The tunnel allows travelers to access trains running between the two countries, acting as a cheaper and more sustainable alternative to airplanes. The tunnel also earns revenue by operating freight trains, transporting goods beneath the channel. Stormwater Management And Road Tunnel (SMART) is a dual purpose tunnel that serves as a storm drainage and road structure in Kuala Lumpur, Malaysia. The 6 mile tunnel is the longest storm water tunnel in South East Asia and second longest on the continent. Receiving the UN Habitat Scroll of Honor Award in 2011, the tunnel eases flash floods in Kuala Lumpur and is reducing congestion along the areas major expressways. For a full documentary on the project, visit here. Cities in Asia, Europe, Latin America, Russia, the Middle East and the United States all have ongoing projects aiming to provide tunnels to manage traffic and expand their subway systems. 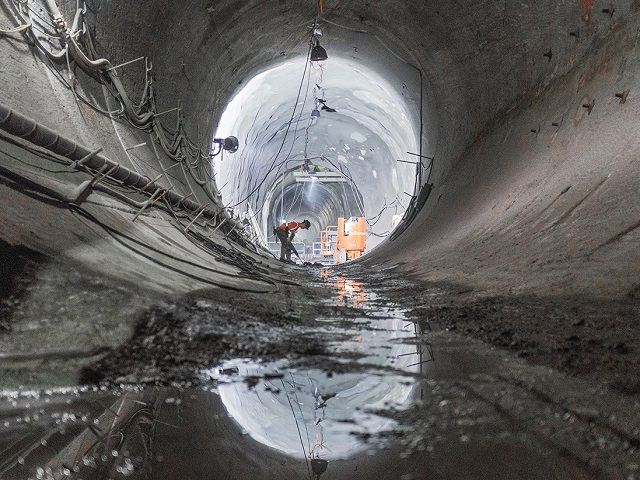 Using TBMs, tunnel projects are also being built to provide sewage and critical flood management solutions that offer cross-benefits in other areas, such as river restoration. Examples include Sao Paolo’s Metro lines (4 and 5), which span 30 miles and Jakarta’s integrated tunnel, which will cover 7.5 miles by 2018. In the future, as the demand for space in urban areas increases, more tunnels will be bored to provide solutions for cities’ diverse needs. And, as the next frontier of urban growth, cities are already expanding the use of TBMs, exploring the use of underground space to provide a sustainable environment. For example, drawing on the examples of Moscow’s subterranean tunnels and Montreal’s underground city RESO, cities like Amsterdam, Chicago and Singapore are hoping to move construction underground to provide valuable space for homes, offices, and other commercial spaces. As the technology behind TBM improves and becomes more cost efficient, more cities should turn to underground tunnels to create denser, less-congested and more sustainable cities.